What Is Osteoporosis? Are You At Risk? Did You See the New Trees in the Park at our Carolina Thread? 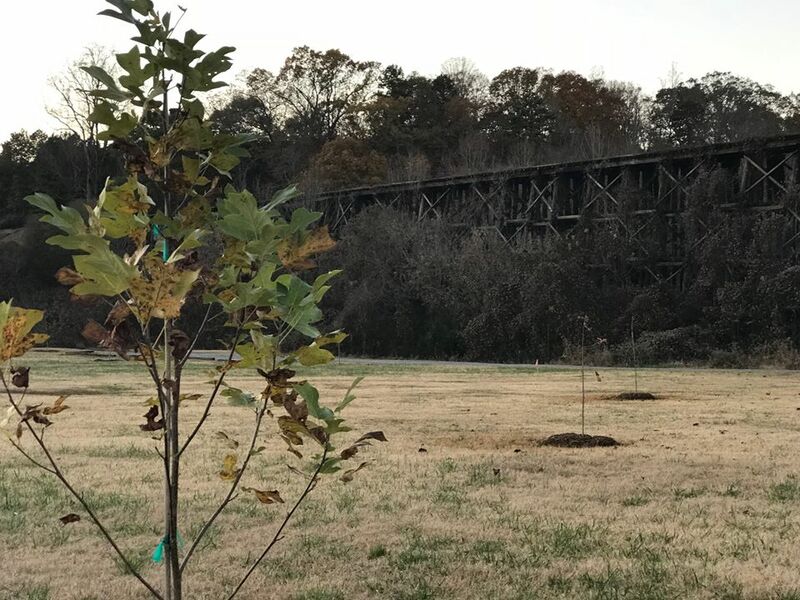 The new trees planted at the First Broad River trailhead in early November are looking like they are off to a great start. In time, these poplars, oaks and sycamores will grow tall and sturdy, providing shade to all the park visitors. Read on to find out what trees and your bones have in common! Did You Know Your Bones Are Like Tree Trunks? These young trees have strong, flexible trunks for support as they grow. Like the tree trunk and branches, your skeleton provides a strong support system for your arms and legs and back. Your bones also protect your spinal column and support your bone marrow which creates the red and white blood cells your body needs. 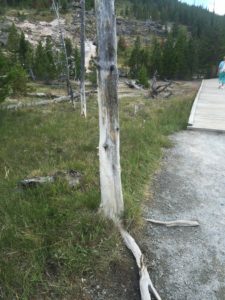 While these new trees are alive and well, their trunks and branches will continually grow and strengthen, with new wood being added to the old as the tree gets larger. The same thing happens with your bones, with the living tissue being broken down and replaced with new bone throughout your life. As these saplings in the park age into mature trees, we can mark their progress and share their shade with our children and grandchildren. As you age, though, your bones don’t always remain strong and supple like a tree trunk. If you turn your gaze from the saplings in the park to the railroad trestle looming above the trailhead, you can see evidence of the trees used to construct the wooden beams. When the trestle was first built, the structure was sound. But as it has aged, the wood has gotten brittle. Your bones can become brittle, too. Like the trestle, your bones will be strongest when you are young. Typically they are the strongest, with the highest bone density, when you are in your twenties. As we get older, it is natural for us to slowly lose bone density. If you have certain medical conditions, take certain medications or are deficient in vitamin D, among other causes, you can begin to lose bone mass at a more rapid rate.. This is called osteoporosis, and it happens when old bone tissue isn’t replaced quickly enough with fresh, new bone. When that happens, you will become more susceptible to bone injuries such as fractures. A fall or a wrong step, or even bumping into that countertop (again) may cause a fracture that wouldn’t have happened when you were younger. But even if you don’t experience a fall, you may notice you’ve gotten shorter as the years have gone by, or you stoop a little more than you used to. Sometimes, you just have pain and can’t pinpoint the cause. Is your thyroid function abnormal? Do you smoke or drink a lot of alcohol or eat less-than-healthy foods? Can men get osteoporosis? Indeed, although it is less common than in women, men can also suffer bone loss and develop osteoporosis. If you answer yes to some or all of the above questions, it’s a good idea to talk to your doctor about your risk for osteoporosis. If you are also experiencing constant pain in your neck or back or other areas you may have injured, it’s very important to visit your doctor to find out for sure. Get plenty of protein. Protein is one of the building blocks of bone. Get plenty of calcium, too. Dark leafy greens and canned fish with bones are two good sources. A calcium supplement taken daily has been shown to help. Exercise, combining strength training with balance exercises. Make sure you’re getting enough vitamin D. If you can’t go outside to get it from sunshine, you can add supplements to your diet. What happens if your doctor suspects you have osteoporosis? When you come into Shelby Medical Associates to be screened for osteoporosis, the doctor will first evaluate your answers to questions like the ones listed above. If it is determined that you are indeed at risk, you will be sent down the hall for a DEXA scan, a kind of x-ray used to calculate your bone mineral density. The scan only takes a few moments and is painless. The results from the scan are your T-score, which is given as a number ranging from +1 to -2.5 or lower. Any score from -2.5 or lower means you have osteoporosis, and your doctor will then discuss treatment options with you and how to avoid fractures. Keeping your bones healthy and strong is an important part of your overall well-being. Eating well, exercising and monitoring your risks for osteoporosis can help you maintain good bone health. When your bones are strong, you can go out and enjoy those new trees in the park and admire that old trestle. Call today to schedule an appointment to see if you have osteoporosis or any of the risk factors associated with bone loss. We look forward to seeing you.